The SR50ATH is a sonic distance sensor with an integrated external temperature probe and heater. Sonic sensors determine distance by emitting an ultrasonic pulse and then measuring the elapsed time between the emission and return of the pulse. The temperature probe allows the SR50AT series to output temperature-corrected values (speed of sound varies with temperature). The integrated heater prevents ice and rime from coating the transducer. The sensor's heater cable cannot be replaced in the field and must be sent to the Service Department for replacement. A Returned Material Authorization is required. The SR50ATH is an identical unit to the SR50A with the addition of an external temperature sensor and transducer heater. The temperature sensor requires a six-plate radiation shield. The addition of a heating element around the transducer prevents ice and rime from coating the transducer with minimal power requirements. The SR50ATH outputs a temperature-corrected distance reading, eliminating the need for further post-processing, as well as a separate temperature reading. The SR50ATH was designed to meet the stringent requirements of measuring snow depths and uses a multiple echo processing algorithm to help ensure measurement reliability. 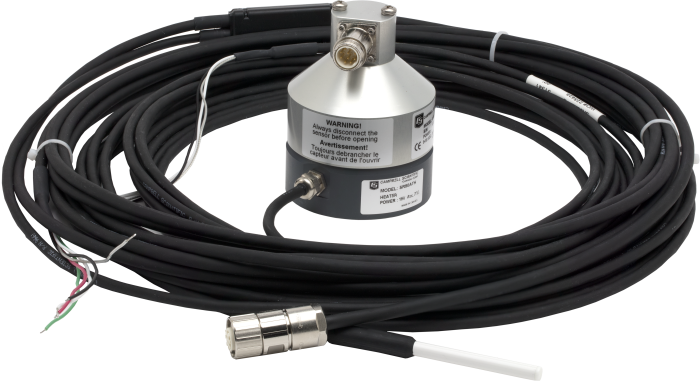 The SR50ATH is compatible with all current Campbell Scientific data loggers, as well as many other data acquisition systems. Nominal Operating Voltage 12 V (ac or dc) Use a properly conditioned low-noise power source. A noisy power source will affect operation of the sensor.